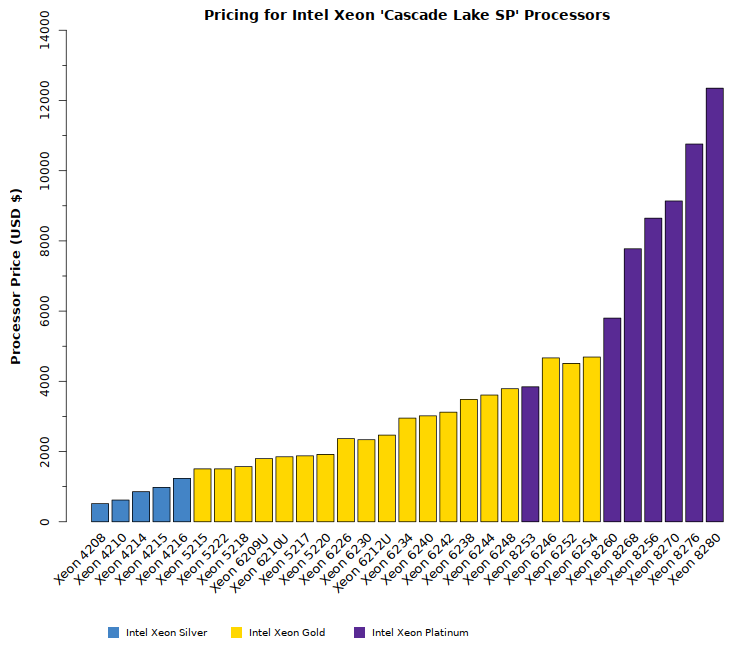 This article provides in-depth discussion and analysis of the 14nm Intel Xeon Processor Scalable Family (formerly codenamed “Cascade Lake-SP” or “Cascade Lake Scalable Processor”). “Cascade Lake-SP” processors replace the previous 14nm “Skylake-SP” microarchitecture and are available for sale as of April 2, 2019. These new CPUs are the second iteration of Intel’s Xeon Processor Scalable Family. They remain compatible with the existing workstation and server platforms, but bring incremental performance along with additional capabilities and options. With a product this complex, it’s very difficult to cover every aspect of the design. Here, we concentrate primarily on the performance of the processors for HPC & AI applications. 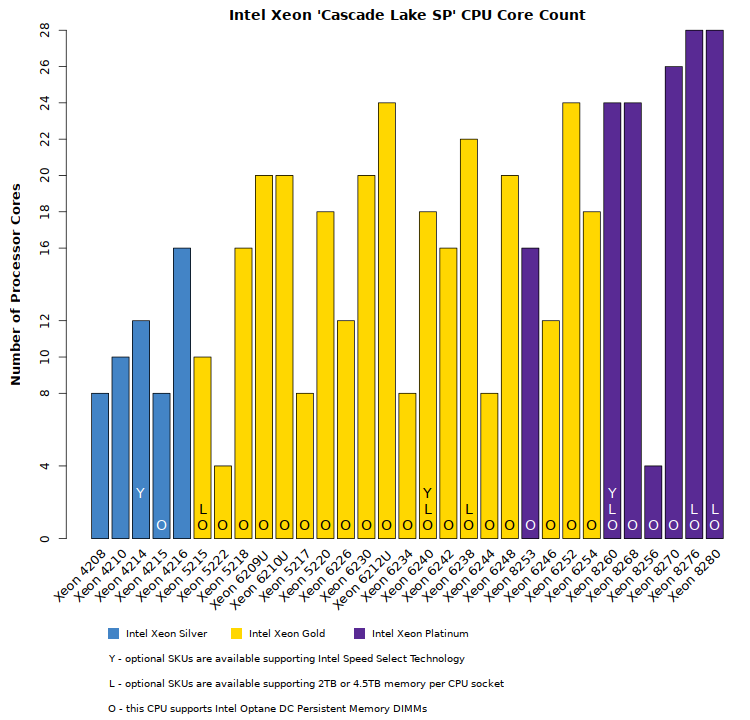 The new “Cascade Lake-SP” processors will be be familiar to existing users. Just as in the previous generation, the processor family is divided into four tiers: Bronze, Silver, Gold, and Platinum. Bronze provides modest performance for a low price. 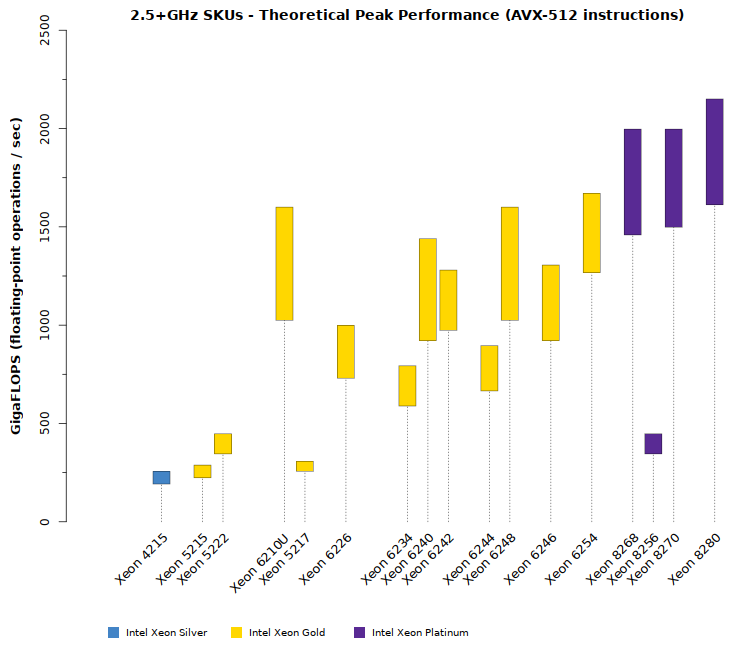 The Silver and Gold models are in the price/performance range familiar to HPC users/architects. 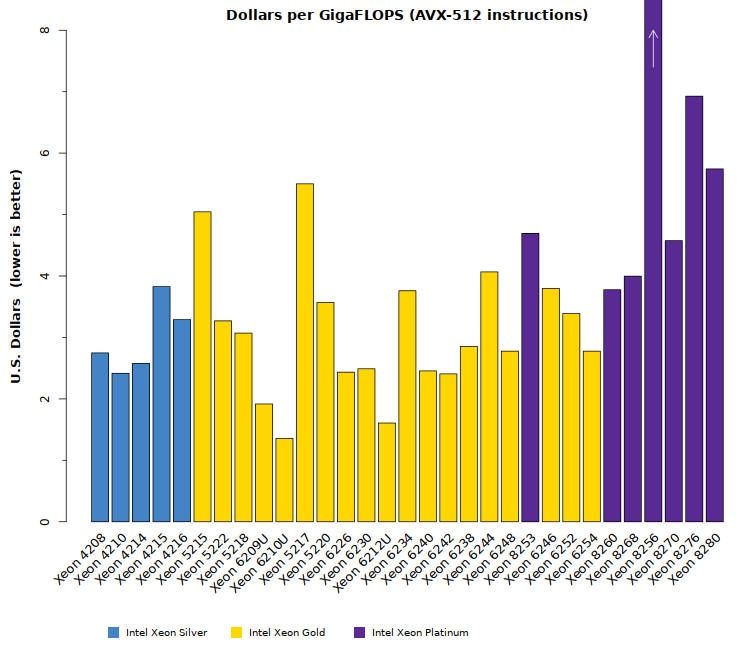 Platinum models are in a higher price range than HPC groups are typically accustomed to (Platinum tier targets Enterprise workloads, and is priced accordingly). The single-socket optimized CPUs are indicated with a U suffix in the model name (e.g., Xeon 6210U). These CPUs are quite cost-effective for what they offer (a 6200-series CPU for a 5200-series price). However, they do not include UPI links and thus can only be installed in systems with a single processor. Intel Speed Select CPUs are indicated with a Y suffix in the model name (e.g., Xeon 6240Y). Each of these three CPUs offers the same core count and clock speed as their non-Y counterpart. However, the system can be rebooted into a lower core-count mode which boosts the CPU clock and Turbo Boost speeds. The Speed Select models available in this generation are: 8260Y, 6240Y, and 4214Y. Although these models are not called out by name below, understand that alternate versions of Xeon 8260, 6240, and 4214 are available if you need core count & clock speed flexibility. Base-level model with low performance. 4200-series models offer slightly improved performance over previous generations. Although these 8200-series models provide the highest performance, their higher price makes them suitable only for particular workloads which require their specific capabilities (e.g., high core count, large SMP, and large-memory Compute Nodes). 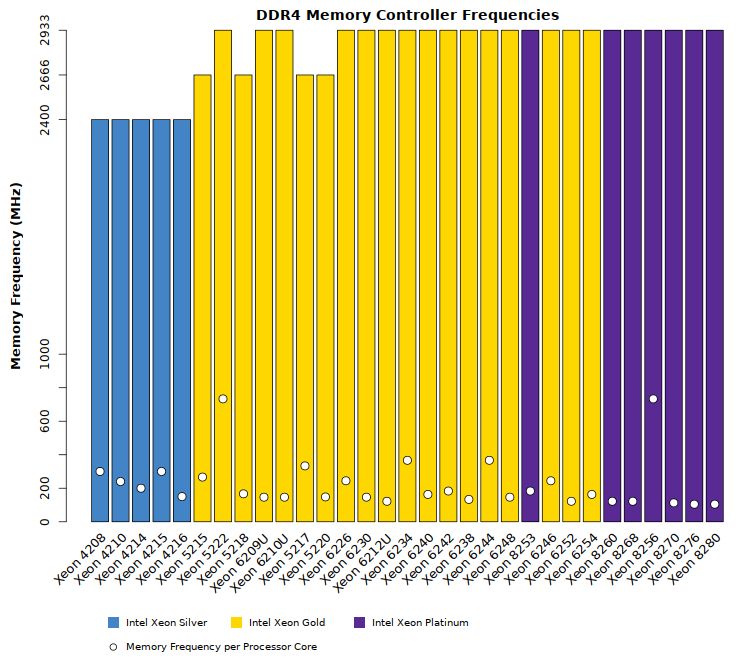 As shown above, the shaded/colored bars indicate the expected performance ranges for each CPU model. The first plot shows performance when using Intel’s AVX-512 instructions with FMA. Note that only a small set of codes will be capable of issuing exclusively AVX-512 FMA instructions (e.g., LINPACK). Most applications issue a variety of instructions and will achieve lower than peak FLOPS. Applications which have not been re-compiled with an appropriate compiler will not include AVX-512 instructions and thus achieve lower performance. 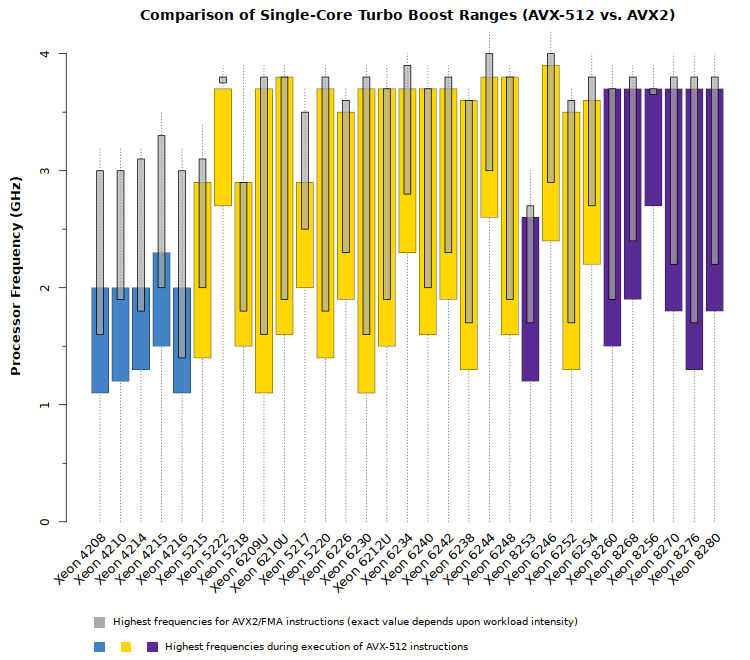 Those expected performance ranges are shown in the plot of AVX2 Instruction performance. Although the ordering of the above plots may seem arbitrary, they are sorted by price (as discussed in the next section). The lowest-performance models provide fewer numbers of CPU cores and fewer AVX math units. Higher-end models provide a mix of higher core counts and higher clock speeds. A few CPU models, such as Xeon 6244 and Xeon 8256, strongly favor high clock speeds over CPU core count (which results in lower overall FLOPS throughput). 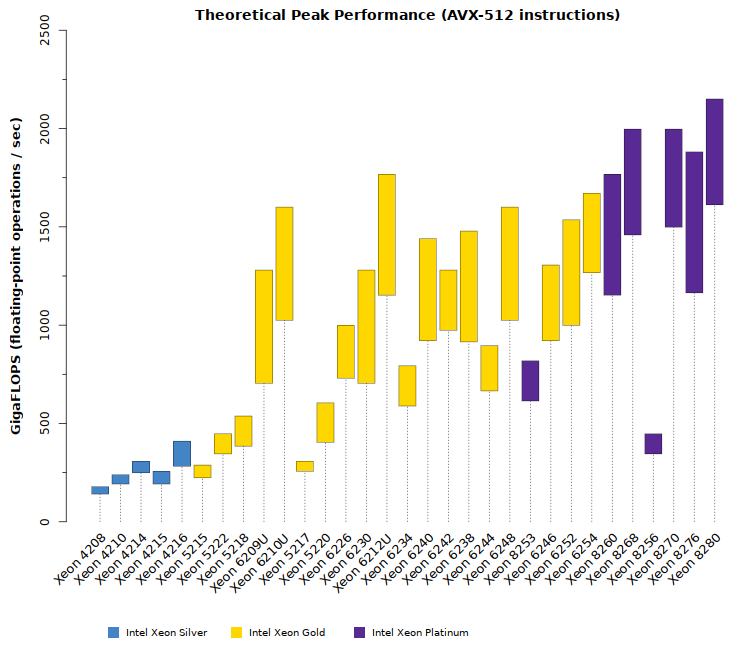 HPC and AI groups are expected to favor the Intel Xeon Gold processor models. As in the above plot, all the CPUs in this article are sorted by price. 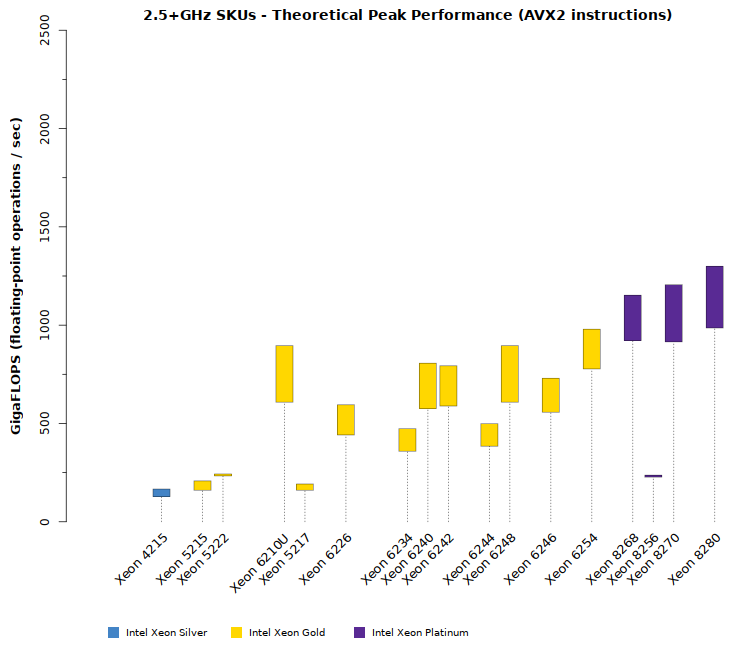 Most HPC users are expected to select CPU models from the Gold Xeon 6200-series. These models provide close to peak performance for a price under $4,000 per processor. Certain specialized applications will leverage the Platinum Xeon 8200-series, such as very large memory nodes (>3TB system memory). To ease comparisons, all of the plots in this article are ordered to match the above plot. Keep this pricing in mind as you review this article and plan your system architecture. Most HPC groups will find that processors with 12 to 20 CPU cores fit within their budget. Systems with up to 24-cores per CPU will not be shockingly expensive. However, the 26-core and 28-core models are only available within the Platinum tier and will be at a higher cost than most groups would consider cost-effective. 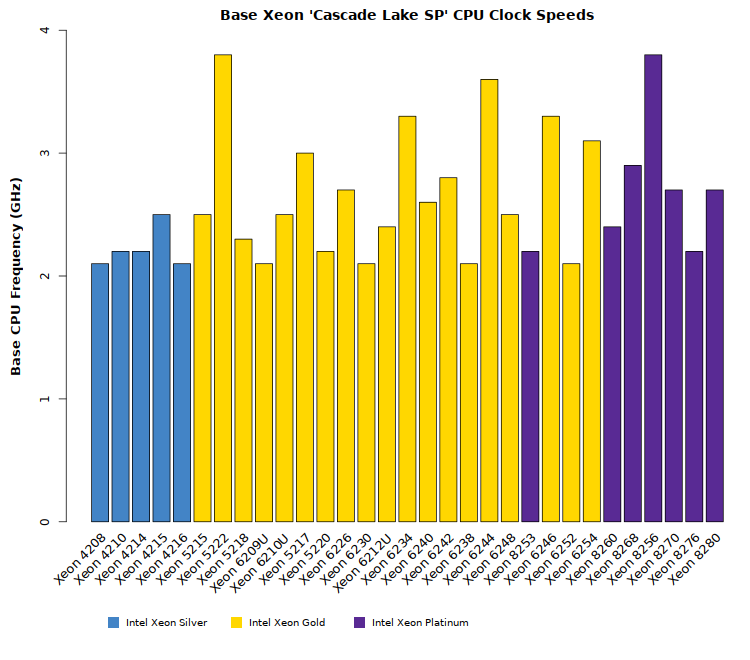 Memory performance of Intel Xeon “Cascade Lake-SP” is fairly straightforward, with the Silver CPUs providing a lower speed than the Gold and Platinum models. The amount of memory bandwidth available per CPU core is an important factor, but is simply a function of the number of cores. Users planning to run on CPUs with higher core counts need to ensure that each core won’t be starved of data. It is important to note that some system platforms support two memory slots per memory channel (a total of 24 DIMMs in a dual-socket system). If both memory slots are populated with memory, the slots will run no faster than 2666MHz (this is simply an electrical/signaling limit). As shown, the 6200-series and 8200-series CPUs provide two AVX-512 units per processor core. All remaining CPUs (with the exception of the Xeon 5222) include a single AVX-512 unit. 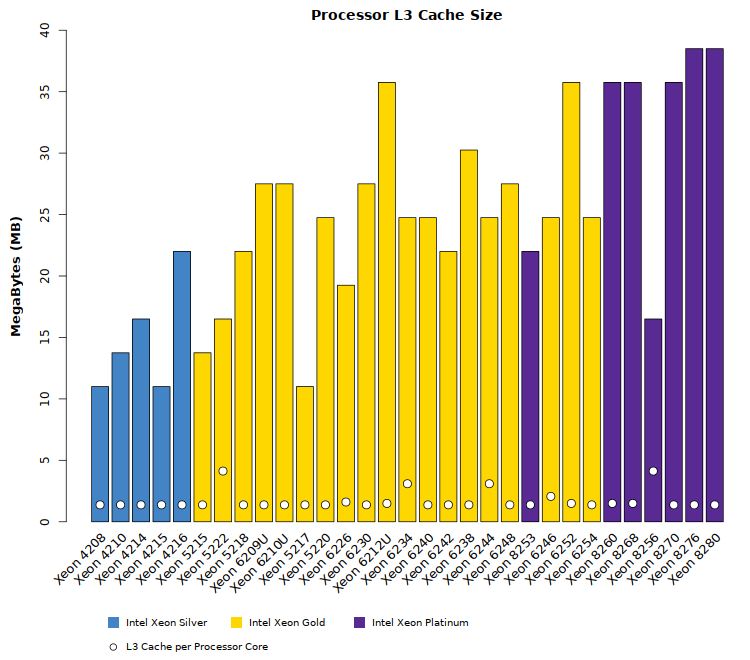 The “Cascade Lake-SP” CPUs have been designed to offer at least 1.375MB of L3 cache per processor core. As shown below, there are several models which feature a larger quantity of L3 per core. Remember that each core also has 1MB of private L2 cache. In this architecture, the L3 cache is designed as a fallback for data that spills out of L2. The UPI capabilities of these CPUs are nearly identical to the previous generation. Each CPU supports two or three UPI links operating at 9.6GT/s to 10.4GT/s. 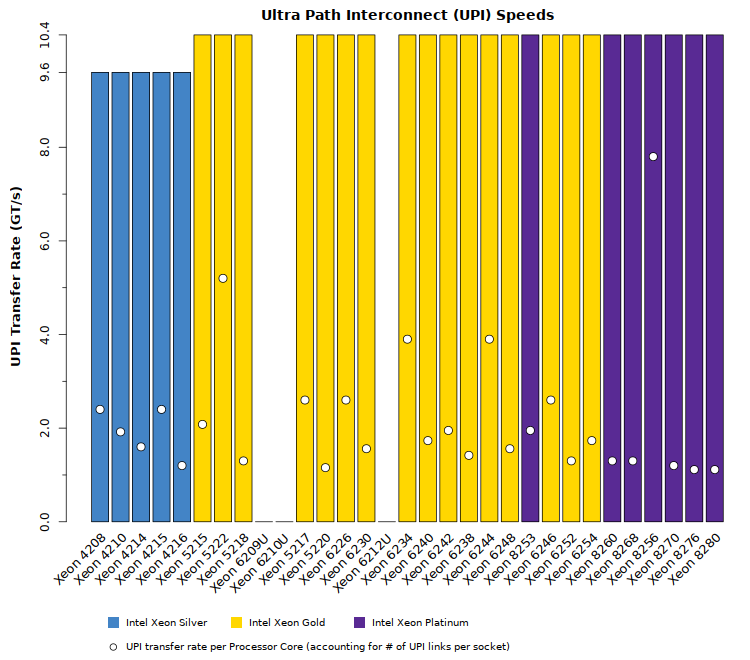 Only the Xeon 6200-series and 8200-series support the higher number of UPI links, which allows greater connectivity between sockets. Dual-socket systems are the most popular configuration for HPC, but not all dual-socket platforms support all three UPI links – review your proposed system architecture. Although dual-socket systems are the most common for HPC & AI workloads, there are use cases requiring larger or smaller numbers of CPUs. 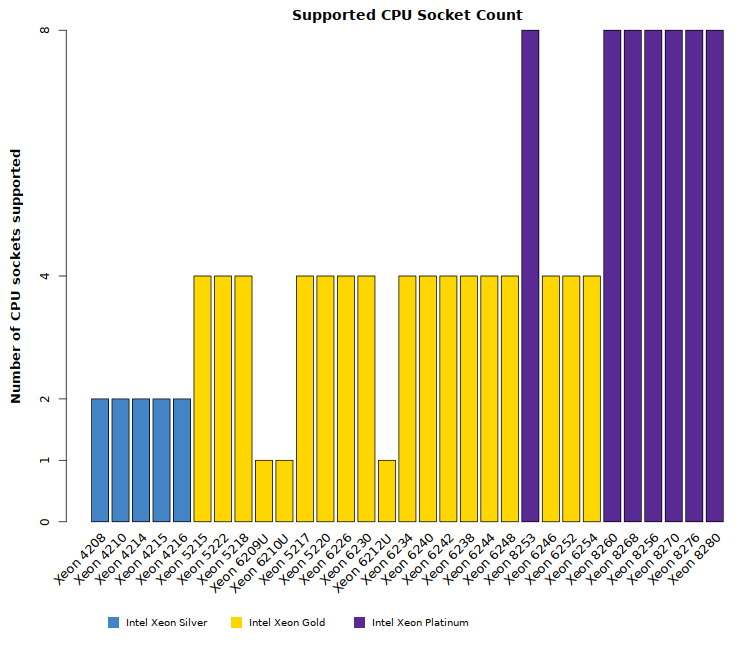 The plot below compares the various CPU socket counts supported by this processor line-up (ranging from a single socket to eight sockets). Take note that although the 5200-series CPUs support four sockets, they only provide dual UPI links. HPC users are advised to look to 6200- and 8200-series models for four-socket systems. Although there are still processor models in the same power range as previous generations, an increasing number of models feature TDPs above 140 Watts. A few models even reach over 200 Watts. HPC users must be certain that the systems they select have received thorough thermal validation. Systems which run warm will suffer lower performance. In particular, care is recommended with higher clock speed CPUs (2.5+ GHz) which may reduce their clock speeds more aggressively to remain within thermal limits. 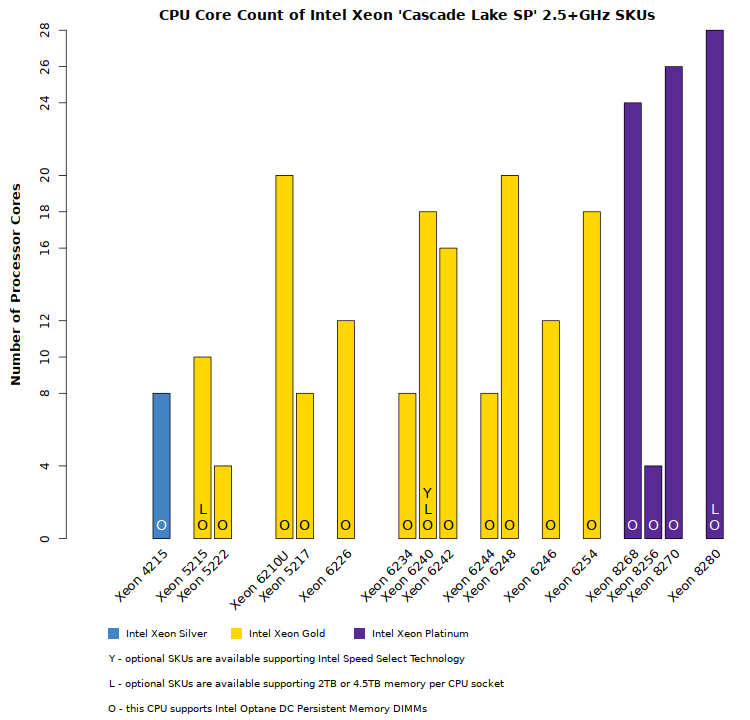 In addition to the specifications called out above, technical readers should note that the “Cascade Lake SP” CPU architecture inherits most of the architectural design of the previous “Skylake-SP” architecture, including the mesh processor layout, redesigned L2/L3 caches, greater UPI connectivity between CPU sockets, and improvements to the processor frequency speeds/turbo. A more comprehensive list of features is shown at the end of the article. Just as in the previous generation, the “Cascade Lake-SP” architecture acknowledges that highly-parallel/vectorized applications place the highest load on the processor cores (requiring more power and generating more heat). While a CPU core is executing intensive vector tasks (AVX2 or AVX-512 instructions), the clock speed will be adjusted downwards to keep the processor within its power limits (TDP). Each of the “modes” above is actually a range of CPU clock speeds. The CPU will run at the highest speed possible for the particular set of CPU instructions that have been issued. It is worth noting that these modes are isolated to each core. Within a given CPU, some cores may be operating in AVX mode while others are operating in Non-AVX mode. Each CPU also includes the Turbo Boost feature which allows each processor core to operate well above the “base” clock speed during most operations. The precise clock speed increase depends upon the number & intensity of tasks running on each CPU. 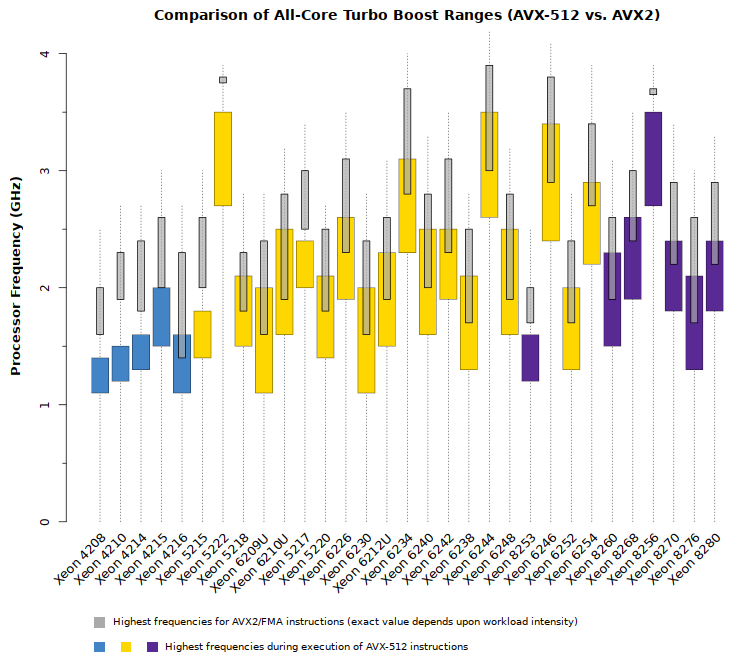 However, Turbo Boost speed increases also depend upon the types of instructions (AVX-512, AVX, Non-AVX). The dotted lines represent the range of clock speeds for Non-AVX instructions. The thin grey bars represent the range of clock speeds for AVX2/FMA instructions. The thicker shaded/colored bars represent the range of clock speeds for AVX-512/FMA instructions. Note that despite the clear rules stated above, each Turbo Boost value is still a range of clock speeds. Because workloads are so diverse, Intel is unable to guarantee one specific clock speed for AVX-512, AVX, or Non-AVX instructions. Users are guaranteed that cores will run within a specific range, but each application will have to be benchmarked to determine which frequencies a CPU will operate at. Despite the perceived reduction in performance when running these vector instructions, keep in mind that AVX-512 roughly doubles the number of operations which can be completed per cycle. Although the clock speeds might be reduced by nearly 1GHz, the overall throughput is increased. 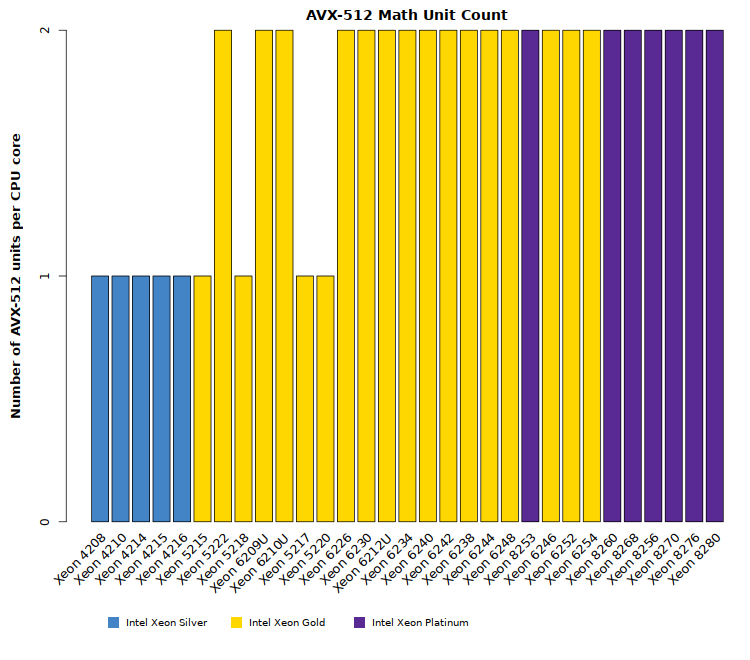 HPC users should expect their processors to be running in AVX or AVX-512 mode most of the time. 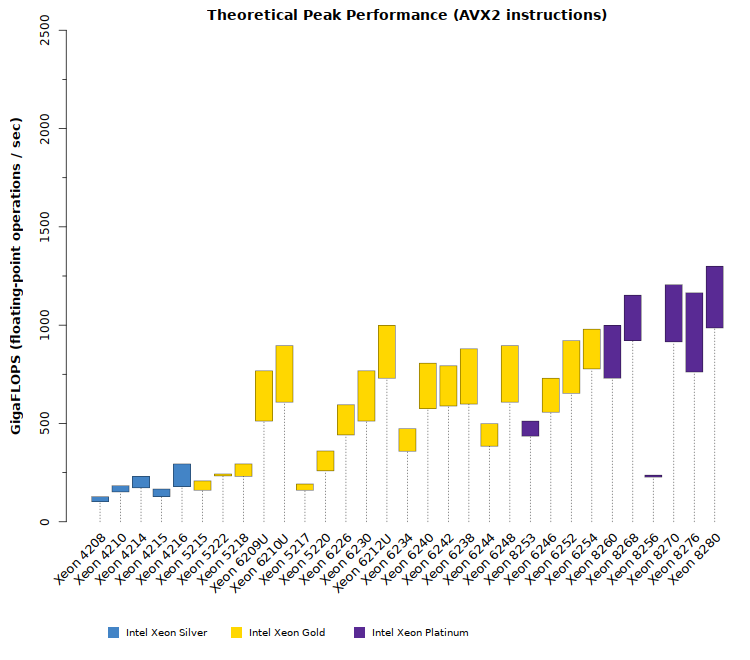 HPC applications run best on the higher-end Gold and Platinum CPU models (6200- and 8200-series), as all of the lower-end CPUs provide only half the number of math units. The Platinum models (8200-series) are generally targeted towards Enterprise and Finance – these carry higher prices than other models. 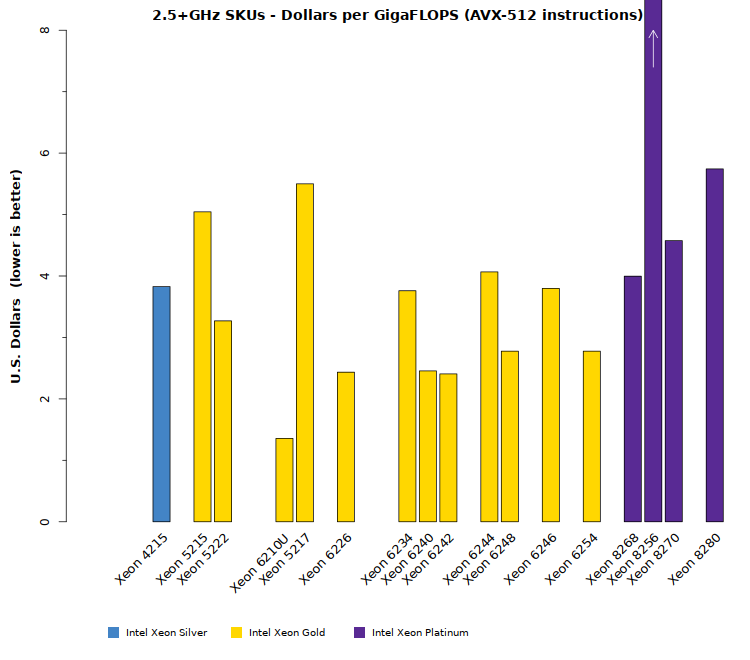 The plots below compare the cost-effectiveness and power efficiency of these CPU models. The intent is to go beyond the raw “speeds and feeds” of the processors to determine which models will be most attractive for HPC and Deep Learning/AI deployments. In general, the Xeon 6200-series provide the most cost-effective performance. The Xeon 4200- and 5200-series CPUs are priced lower, but include only a single AVX-512 math unit (which reduces their cost effectiveness considerably). 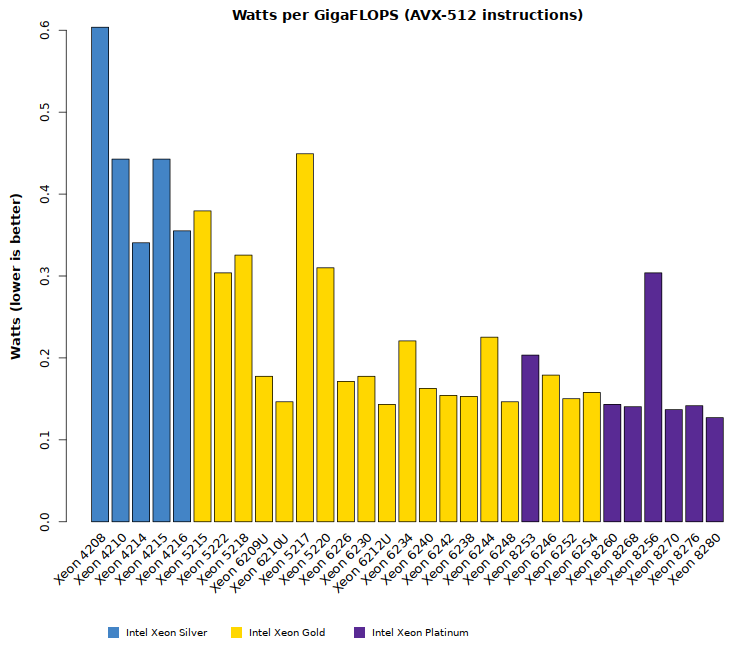 The Xeon 8256 is an outlier as it was not designed for cost-effectiveness (instead optimizing for four high-speed CPU cores). 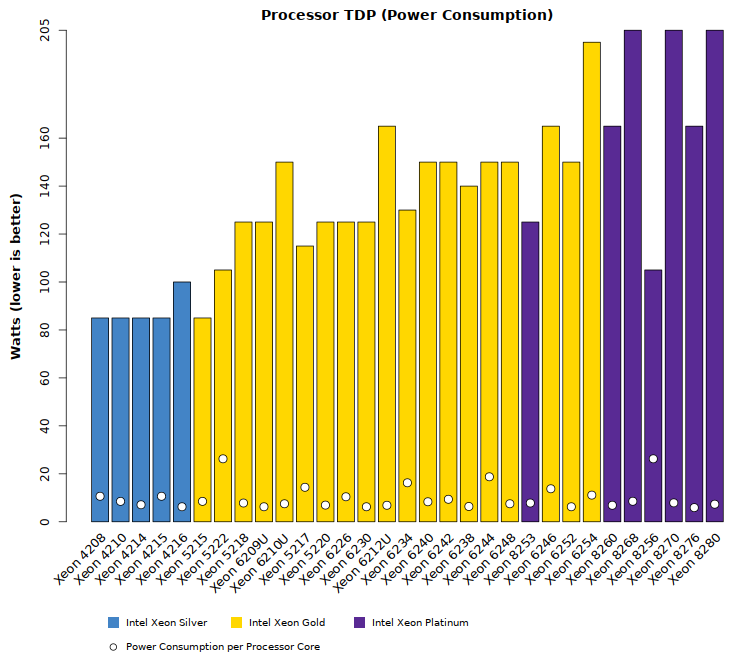 This plot compares the power requirements (TDP) versus performance throughput of each CPU. Although this generation includes some of the highest-wattage CPUs to date, each is actually quite power efficient. In fact, even the 205-Watt CPU models are among the top most-efficient models in this product line. Overall, any CPU selected from the Xeon 6200- or 8200-series will be close to the most efficient CPU on the market. Groups which select the lower-price 4200-series CPUs will end up spending more on power per useful work completed. Although many of these CPU models will offer excellent performance, it is common for HPC sites to set a floor on CPU clock speeds (usually around 2.5GHz). The intent is to ensure that no workload suffers too low of a performance. While there are users who would prefer higher clock speeds, experience shows that most groups settle on a value of 2.5GHz to 2.6GHz. With that in mind, the comparisons below highlight only those CPU models which offer 2.5+GHz performance. Hyper-Threading technology allows two threads to “share” a processor core for improved resource usage. Although useful for some workloads, it is frequently disabled for HPC applications.